For the brine, bring water, vinegar, salt, and sugar to boil, remove from heat, and allow it to cool. Slice the seedless cucumbers. Peel and slice onion. Finely chop dill. 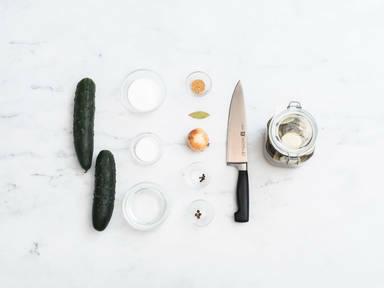 Add cucumbers, onions, mustard seeds, chopped dill, black peppercorns, allspice berries, and bay leaf to a glass jar. Now fill the cold brine into the glass jar so that the pickles are completely covered. Finally, transfer the glass jar into a pot with canning rack and let simmer for approx. 15 to 20 min. Enjoy!